Borussia Dortmund maintained their unbeaten record in the Rückrunde after coming from behind to beat FC Augsburg 3-1. Given the superior opponent, Markus Weinzierl changed Augsburg’s system massively. Instead of their customary 4-2-3-1 system, they employed a back five, with Jeffrey Gouweleeuw, Jeong-Ho Hong and Ragnar Klavan playing in the middle of the defence. Daniel Baier and Dominik Kohr were fielded in central midfield. Borussia Dortmund, meanwhile, came in with a few personnel changes, as Nuri Şahin played alongside Julian Weigl in midfield in a 4-3-3 shape. Erik Durm and Łukasz Piszczek were Dortmund’s full-backs. Shinji Kagawa played as number ten at first. The balance of power became obvious early on. 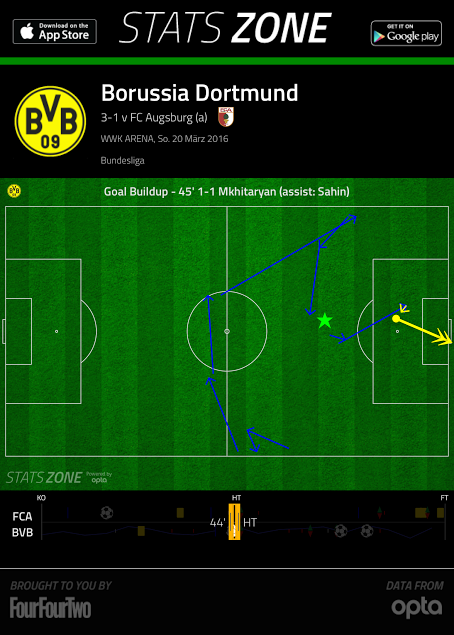 Dortmund saw much more of the ball, yet had problems to move the ball upfield. Happy to sit back, Augsburg used their horizontally compact back five to close the gaps Dortmund wanted to play through. Normally, the ball-near full-back left his position to slightly pressure the ball-carrier on the wing, while the far-side full-back stayed at the offside line. Especially Paul Verhaegh tried to stay close to Erik Durm who was Dortmund’s more attacking full-back. Both Baier and Kohr showed diagonal movement towards the higher half-spaces. 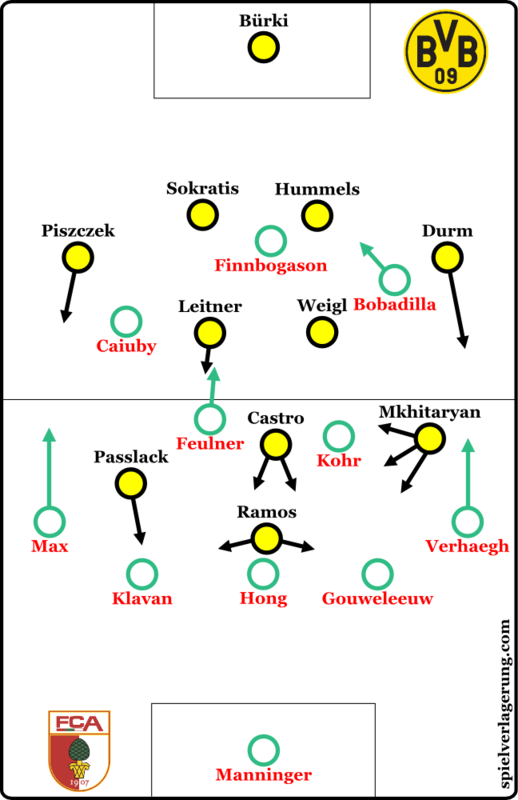 Kohr frequently made runs into Dortmund’s left half-space, because he intended to contain the likes of Şahin and Mats Hummels who were often positioned there in the early build-up. Interestingly, Iceland striker Alfreð Finnbogason was positioned on the right side of Augsburg’s pressing line, while Koo Ja-cheol stood in the middle man-marking Weigl. Although both frequently switched positions, Finnbogason usually pressured Hummels. Sokratis enjoyed the most freedom, because Augsburg, like other teams before, identified him as Dortmund’s weakest build-up player. He had 109 touches after the first 45 minutes. Through this pressure, Augsburg made it really tough for Dortmund to gain ground, when the Schwarzgelben were building up. Due to the hosts’ man-marking scheme, Thomas Tuchel’s side were often forced to play backward passes or circulate the ball laterally, without having a good chance to move the ball forward effectively. During the first half, only 1.6 percent of Dortmund’s successful passes were played inside the Augsburg penalty area, per FourFourTwo. Dortmund having up to 80 percent possession yet not taking much risk to create goal-scoring opportunities, the match became rather dull, even though both teams played an intriguing chess match throughout. To diversify their build-up patterns, Durm begun to rush forward in the first phase of the build-up quite often. As he opened up the space next to Hummels, BVB either moved the three defenders left a few yards to the left or Şahin, never feeling comfortable when pressed heavily, dropped back and collected balls in the deep left half-space. He then pulled Kohr out of the centre, which left Baier alone in the middle. However, Dortmund often couldn’t bypass Augsburg’s first pressing line, at least when intending to come through the middle. Shinji Kagawa didn’t help by showing a rather odd movement pattern in the early phase of the match. The Japanese often drifted to the right side. When Weigl, in addition to that, decided to drop between the centre-backs, then a huge hole occurred in the centre of Dortmund’s formation. On top of this, cross-field passes and lateral balls from Dortmund in the middle third looked slow. This lack of intensity made it even easier for Augsburg to shut down driving lanes. Near the halfway line, Tuchel’s players were usually afraid of one-on-one-situations, as they feared losing the ball early in the build-up, with only little cover at the back line. With that said, the inevitable happened. In the 16th minute, Augsburg left-back Philipp Max received a long diagonal ball, which suddenly left Dortmund’s centre-backs exposed. 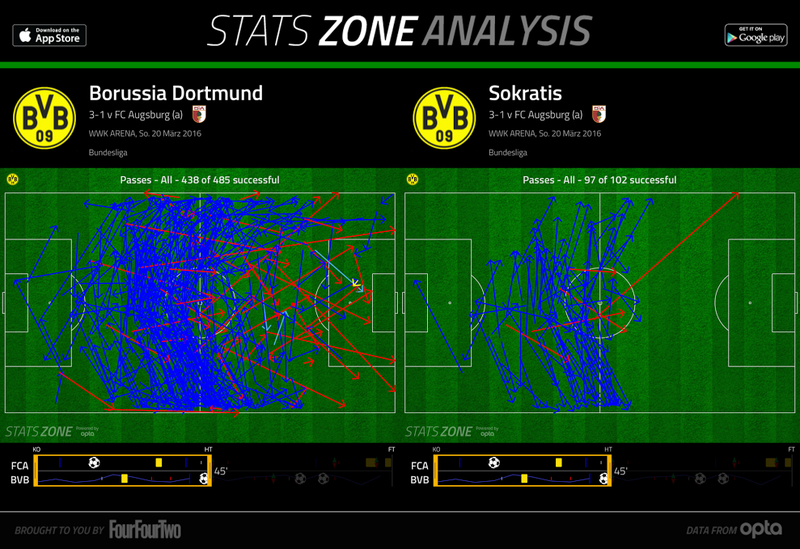 Sokratis was more or less outnumbered on his team’s right side. Max slid a short forward pass into the path of Caiuby who raced clear on the wing before cutting the ball back for Finnbogason who caught man-marker Hummels on the wrong foot. Afterwards, Dortmund were forced to improve their possession game. Kagawa began to roam through the middle, picking his spots to receive the ball, standing between Baier and Kohr. Centre-forward Adrián Ramos, however, was still struggling to adapt his movement to his team-mates’ runs. He often chose the wrong path and ran into the cover shadow of Augsburg’s defenders. Augsburg’s 5-2-3 not only meant they had a spare centre-back in the middle, but it meant also that this formation provided enough depth. Simultaneously, they were able to press high up the pitch with a 2-3 or 2-1-2 formation, supported by at least one full-back, while also setting up a deep block. Fortunately for them, Baier is simply great at covering big portions of space on his own. Hence he could protect Kohr when Kohr was moving forward. As the first half continued, Marco Reus more frequently positioned himself near the sideline, so he pulled Gouweleeuw out of the centre, while Hong didn’t move a few yards to the right to fill the inside-right channel. The South Korean defender usually kept his position in the middle. Augsburg took a risk, but seemed to feel certain that Dortmund couldn’t hurt them there. Dortmund found the right answer when Mkhitaryan gave up his position on the right side and started to roam through the number ten’s space more frequently. Then the Armenian took control of the game. He created the first big chance for Dortmund in the 41st minute, when he dribbled laterally through the zone in front of Augsburg’s 18-yard-box, and Reus got in behind the back line from a lobbed Mkhitaryan pass. Moments later, Mkhitaryan dropped into the left half-space, which led to Şahin running upfield. Şahin’s presence near the opposing back line ruined Augsburg’s numbers advantage and it was ultimately a reason Dortmund scored the equalising goal before the halftime break. In the 45th minute, Mkhitaryan dribbled through a small pocket in the middle of the Augsburg half. His ball found Reus who passed it on to Şahin. The 27-year-old then laid the ball off for Mkhitaryan to score from close distance. Weinzierl had to replace Baier, who had injured his foot, at the beginning of the second half. Markus Feulner took up Baier’s station. Meanwhile, Tuchel brought Gonzalo Castro on in place of Reus. Castro was deployed on the right side, with Mkhitaryan playing on the left. But Castro mostly served as an additional centre-midfielder, as he mostly played in what we call a number eight role. Kagawa increasingly rushed towards the offside line, while both Castro and Mkhitaryan were crucial as passing players in the half-spaces. 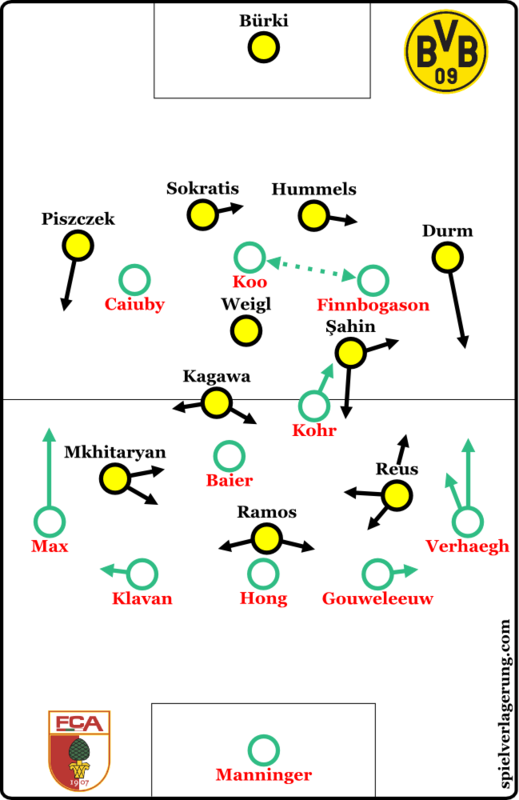 Moreover, both showed effective diagonal movement, as Mkhitaryan made various runs into the centre of the offense, and Castro attacked Feulner’s zone from the outside. In addition, Şahin still intended to penetrate the left half-space which resulted in Dortmund overloading that zone of the field, binding Kohr on Augsburg’s defence, which, of course, weakened the hosts’ pressing efforts. But that didn’t deter Augsburg from taking risks. Situationally, their midfielders and full-backs moved comparatively high up the pitch to apply more intense counter-pressing behind Koo, Caiuby and Finnbogason. The next adjustment made by Tuchel happened in the 62nd minute, when Moritz Leitner replaced Kagawa. Leitner took over Castro’s position and Castro now roamed through the middle. A few minutes later, young Felix Passlack came in, while Şahin left the pitch. Passlack, a rather simple up-and-down runner, played on the right and was asked to regularly burst forward into attack. Leitner moved back to support Hummels and Weigl in the build-up play. Castro stayed in the middle of the park. And the 28-year-old scored only a few moments after Dortmund’s third substitution. Hummels knocked the ball over the top of the opposing back line, while Ramos made an intelligent run in behind the centre-backs – probably his first smart move of the night. The Colombian laid the ball off to Castro who curled the ball into the far corner. Immediately after the goal, Weinzierl made an attacking shift, when Gouweleeuw moved into central midfield. But the new 4-3-3 shape only lasted a couple of minutes, because after Ramos converting BVB’s third goal Weinzierl returned to the back five to limit the damage. Dortmund seemed to be tired out of the gate. But Tuchel’s side can manage to win this kind of match without looking impressive. And even if they struggle to exploit their dominance in terms of ball possession at first, they usually find a way to break through the opposing pressing block. Dortmund didn’t do anything particularly wrong in the first 35 minutes, but Augsburg simply did very well. So the Bavarians shouldn’t kick themselves. Weinzierl provided an intelligent game plan including lots of little details that stabilized Augsburg’s defence. Baier’s injury massively hurt his team, even though Feulner displayed a decent performance. At the end, it was tough to shut down all passing and driving lanes and to appropriately respond to all adjustments Dortmund made over the course of 90 minutes, but especially in the second half. Dortmund looked like the winning team long before they actually scored the goals. They got more and more dominant and at some point I looked if they maybe run out of time and it was still 30 minutes left to go. I think the loss of Baier was key for Augsburg loosing the match. I think with him it’s possible that Augsburg that they kept the draw or at least had a fighting chance after the Castro goal.